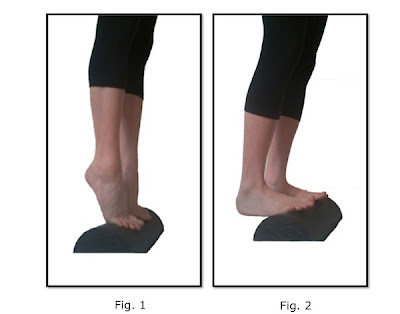 This exercise is intended to increase the range of motion at the ankle joint. It is very similar to the calf raise with a straight leg from the floor but it adds the step or stair that increases the proprioceptive challenge as well as the range of motion. Your balance will be more precarious in this situation so a gentle hand on the stair railing may be of assistance when you are beginning this exercise. As with all of these ankle exercises it is important to think of it as a full body exercise. Even though we are isolating the movement of the ankle you want to imagine beginning this movement by reaching the top of the head to the sky. You can also imagine lifting your belly button and your heel at the same time when you exhale.